Successful relationships are often built on a foundation of love and of trust. Marital agreements are a way for couples to strengthen their relationship through open and honest planning for the future. Rather than viewing marital agreements as a negative or as a safety net, it may be helpful to think of them as a way for you to better understand and protect one another’s long term goals. Marital agreements may cover a variety of topics and are available to couples entering a marriage, married spouses, and those who live together but do not intend to marry. There are a litany of reasons why marital agreements can help bolster your happy relationship. The marital agreement legal team of The Bronzino Law Firm takes pride in serving couples from local Ocean and Monmouth County communities including Wall, Point Pleasant, Toms River, Brick, Howell, Jackson, and across Eastern New Jersey. We applaud couples with the foresight to plan for their futures by considering marital agreements. Our smaller firm size allows our marital agreement attorney to focus on the unique needs and concerns of each of our clients, enabling us to provide highly personalized legal solutions. Call our office today for a free and confidential consultation regarding your marital agreement including prenuptial agreements, postnuptial agreements, cohabitation agreements, palimony agreements, and more. The most well known of all forms of marital agreements is the prenuptial agreement. Pre-nuptial refers to the fact that these agreements are entered into before a marriage is finalized. Our Toms River prenuptial agreement attorney understands that while this type of agreement may have a negative stigma, that reputation is far away from the reality. Prenuptial agreements may cover complex legal topics including alimony and the equitable distribution of marital assets. It is important to understand that it is not legally enforceable nor recommended to include issues of child support or child custody in your prenuptial or postnuptial agreement. This is due to the fact that New Jersey law considers these issues in the best interests of the children and not per the wishes of the parents. Postnuptial agreements, otherwise known as mid-marital agreements, are extremely similar to prenuptial agreements. The primary difference is that they are entered into after the couple has already been married. This type of agreement may be a modification or amendment to a pre-existing prenuptial agreement or a new marital agreement. Much like prenuptial agreements, postnuptial agreements primarily handle financial topics including division of assets, alimony, and more. Issues of child custody and child support are once again not enforceable. These, and all other types of marital agreements also must adhere to strict guidelines in order to be enforceable in New Jersey. We discuss this checklist for enforceability in a section below. “Marital agreements” may also refer to agreements signed by unmarried couples who live together. Unlike prenuptial and postnuptial agreements, cohabitation agreements have the power to discuss issues like child custody and child support in the present. The caveat is that you still may not include future child custody or child support considerations in the event of a separation. Once again, this is because such terms are not enforceable after your relationship has been terminated. The right of both parties to legal representation. It is explicitly stated in New Jersey law that both parties must be legally represented during the marital agreement process. One or both parties may exercise their choice to waive that right, but this action is not recommended. An equitable and reasonable agreement. There is a legal term known as unconscionability in U.S. law which essentially states that if an agreement is fundamentally or overwhelming unjust or one-sided, it cannot be enforced. This holds true for marital agreements. The full disclosure of all assets. Disclosure and valuation of all assets which are being considered in a marital agreement is a critical component of enforceability. 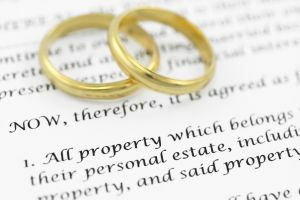 If a significant omission or mis-valuation of an asset comes to light, your entire marital agreement can be called into question and may become invalid. Neither party was rushed or pressured. Agreements signed under coercion or threatening circumstances will not be considered valid. This includes situations where either party was rushed into signing an agreement. The agreement was entered into by both parties with a clear mind. Intoxication, mental disability, or any other reason why either party would not be able to understand the terms of the marital agreement may also lead to an unenforceable document. Marital agreement attorney Peter J. Bronzino has extensive experience helping couples draft enforceable marital agreements in Ocean and Monmouth County towns including Brick, Toms River, Point Pleasant, Wall, Spring Lake, Sea Girt, Jackson, Howell, and all of Eastern New Jersey. Our firm is a strong believer in marital agreements as a part of happy and healthy relationships, and will work with you and your partner to find an agreement that fits your unique needs. Unlike larger firms, our family law attorney takes the time to get to know each one of our clients during the legal process. This emphasis on the attorney-client relationship separates our legal service from many firms who are built on a foundation of churning out clients as quickly as possible for a larger profit. If you are looking for an attorney you can trust for your family law and divorce legal needs, look no further. To get started on or to make changes to an existing prenuptial agreement, postnuptial agreement, or cohabitation agreement, please contact us online or through our Brick, NJ office today by calling (732) 812-3102 for a free and confidential consultation.